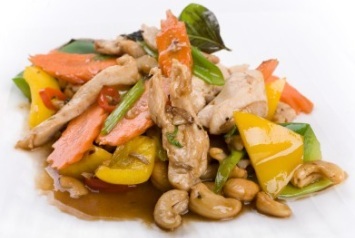 Cashew chicken is one of the most popular Chinese chicken dishes around. Don’t let the long looking list of ingredients deter you. This is a VERY easy recipe to make, as are all stir fry recipes. Combine first 8 ingredients for the sauce and set it aside. In a bowl, combine the next 3 ingredients, Add the chicken and toss. Heat a frying pan to high heat. Add oil. Heat to hot, not smoking. Add chicken, ginger, garlic and onion. Fry and stir until chicken is opaque, about 1 minute. Add peppers and carrots. Stir 2 - 3 minutes. Add snow peas and the sauce. Cook until it comes to a boil. Add the cashews and serve. Use either salted or unsalted cashews, whichever you prefer. Remember that the soy sauce will be salty too. Add more crunch with the addition of crispy fried noodles to the finished stir fry. Great served over boiled rice or Chinese egg noodles. 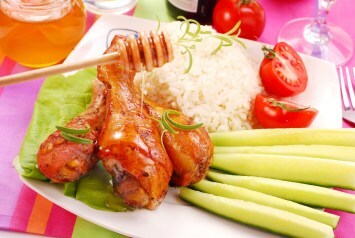 I would make this recipe even healthier by omitting the ketchup, which is high in salt, as well as the sugar. I don’t think you need them. If you like this kind of recipe to be sweet, try cutting them both in half at first and see how you like it. You can always add it back in. Gradually try to keep reducing the amount of ketchup and sugar in the recipe until you omit them altogether. Other than that, this is a very healthy recipe. Serve it over cooked brown rice or even quinoa to make an even healthier meal. There is just something about the combination of chicken pieces, wonderful Chinese seasonings, savory vegetables and crunchy, salty cashews. The best way to make this chicken recipe quickly is to be very organized. Get everything out first, chop and measure it all, then when the ingredient is needed, just pop it in. Find more easy dinner recipes like our Cashew Chicken here.